It's Thursday! It's daring! It's sassy! It's Dare To Be Sassy Thursday! Woot! Woot! This week's challenge is to "make it your own", meaning take a past Dare To Be Sassy Challenge and make it your own. Mine is from not too awful long ago - "Fall Colors". Sorry, but I can't pass up Fall projects - it's my favorite time of year. I used Scarecrow Sassy from the Wizard of Oz Collection. She's so very fall appropriate. The print papers as well as the cardstock for the leaves is by DCWV, the card base is by Hampton Art and of course, she's colored with Copics. I love the little extra pop the blue gives. 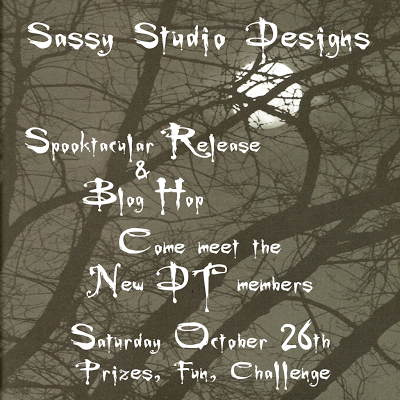 Check out the Sassy Studio blog and add your creation for a chance to win a prize. Speaking of the Sassy site, Saturday we'll be having a new release party! Just wait til you see the fab designs Lindsay has been cookin up! Make sure you join all the fun with the hop and release - you could be a winnah! Jodi, this is wonderful! Love the papers and your coloring is wonderful.